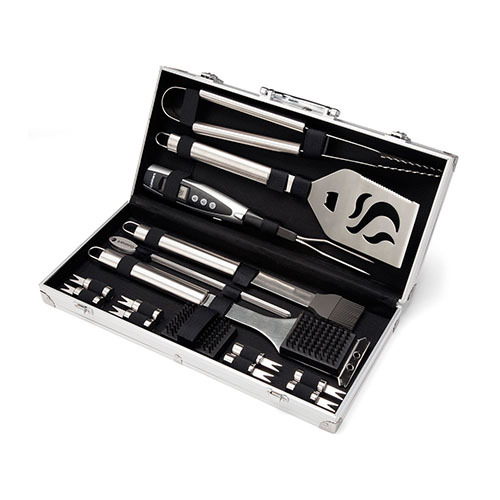 The Cuisinart CGS-5020 is a 20 piece grill set which provides with the essential grilling tools like digital temperature fork, presented in a stylish and durable aluminum carrying case. The digital temperature fork takes the guesswork out of grilling, ensuring food is brought to a food safe temperature. You can even grill at night, since the temperature fork has an integrated LED light that shines brightly on food. The professional stainless steel design makes this 20 piece tool perfect for anyone, whether an amateur griller, seasonal griller, or professional chef. The Cuisinart Deluxe 20-Piece Grill Tool Set has many exciting features for users of all types. You can extend the lifetime of your Cuisinart Deluxe 20-Piece Grill Tool Set with the purchase of a FactoryOutletStore Factory Protection Plan. See the Cuisinart Deluxe 20-Piece Grill Tool Set gallery images above for more product views. 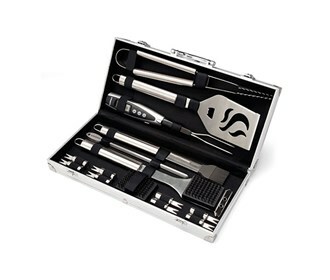 The Cuisinart Deluxe 20-Piece Grill Tool Set is sold as a Brand New Unopened Item.